Heat butter, water, and milk ( microwave 1 minute 5 – 10 seconds) just before boiling. Add Pumpkin, hot water, milk and butter to food processor mix and add flour. Mix just so there are no lumps. Let set for 20 – 30 minutes or refrigerate overnight. In small bowl whisk sugar and all spices, making sure there are no lumps. Add eggs to GF flour and pumpkin mixture in food processor, blend then add sugar and spices. Mix well until all ingredients are blended. Do Not over mix. Using a triggered ice cream scoop (about ¼ cup) fill cups with one scoop of batter. 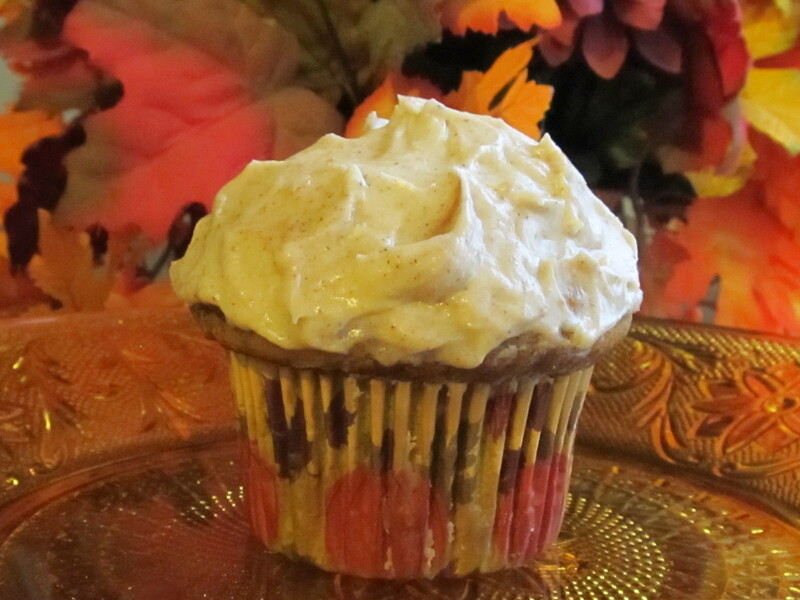 Bake for 25- 30 minutes or until wooden toothpick inserted into center cupcake, comes back clean. This will make 18 cupcakes. Ice with Sugar and Spice Cream cheese icing.